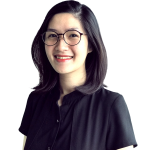 Van Anh is the public policy assistant at Bower Group Asia Vietnam. She assists BGA managers in conducting research and analysis on public policy issues. She monitors the healthcare and agricultural industries and provides weekly briefings on these sectors. Prior to joining BGA, Van Anh was a researcher in the Institute of Public Policy and Management under the Vietnam National University where she supported the director in doing research and organizing workshops on regional development issues. She worked with researchers from a number of leading associations focusing on sustainable development such as Rosa Luxemburg Stiftung Foundation, Japan International Cooperation Agency (JICA) and LEGATO Rice Ecosystem Services. Passionate about sustainable development, Van Anh earned a scholarship from the Government of Japan to the University of Tsukuba to join the Knowledge Co-Creation Program where she learned and applied Japanese practices to help achieve the 17 Sustainable Development Goals. In addition, she joined the “Empowering Rural Women through Livelihood Improvement Program”, a project funded by JICA where she worked with representatives from Southeast Asia and Africa to identify solutions to alleviate challenges facing rural women. Van Anh spent eight years studying in Singapore under an ASEAN scholarship. She earned a full scholarship from the Vietnam Japan University to complete a master’s degree in public policy. Van Anh graduated with honors from the University of London with a bachelor’s degree in business management.